Are you an adventurous pizza lover who orders multiple flavours to try in one seating? Are you Team Thin Crust or Classic New York Crust? For those who appreciate a good slice, we’ve got a pizza information to share. Behold – here are 12 eateries to hit up and amp your pizza game. PizzaExpress specialises in gourmet, hand-made Italian pizza for over 50 years now. If you don’t trust their skills, we don’t know how else to convince you. As a reputable pizzeria, you’d be hard pressed to miss their hero pizza Calabrese as well as the classics like the Lava and Veneziana. They also put a Singaporean spin on their thin and crisp pizza — the Chilli Crab Pizza which suits the local palate. Of course, that’s not all they offer here: look forward to fresh salads and heartwarming pasta that are equally appetising. All you knead is love, and pizza! Gather ‘round the table and enjoy a lovely time with friends and family over wood-fired pizzas and drinks. The L and XXL pizzas at Peperoni are great for sharing with your fellow pizza lovers. We would recommend ordering the Portobello and Chicken Truffle with white sauce if you love that hint of truffle in your food. We know we do! Pete’s Place is one of the oldest and most nostalgic restaurants on the island that serve authentic Italian cuisine that are still a hit amongst the regulars till this very day. Located in the basement of Grand Hyatt Hotel, this rustic spot makes you feel right at home with its signature charm- brick walls and checkered tablecloths that oozes coziness and warmth. The menu offers mouthwatering Burrata Pizza and vegetarian options like Quattro Formaggi Pizza and Funghi Pizza. Expect freshly-made Italian pizzas, pasta, mains, desserts, and cocktails at this unpretentious eatery in Bukit Timah. If you are on a budget and craving for Italian food, this is definitely the place to visit. The Assorted Pizzas come in small (1 slice), medium (4 slices), and large (5 slices). We would recommend getting the large portion so you can try the different flavours in one seating. They are generous with their toppings and the pie crust is made to perfection. Experience the Romano family culture in Singapore through recipes passed down from previous generations. Their pizzas are fire-baked in the oven to perfection with fresh ingredients. Have a slice or two of the Siciliana and Primavera Pizzas that are refreshing to the palate. Vegetarians are in for a treat too! Try the Vegetariana Pizza topped with zucchini, eggplant, mushrooms, olives, tomatoes, and artichoke. At this casual dining spot situated along Stevens Road, you can find freshly made pasta, meaty dishes, and stone-fired oven pizzas. Indulge in over 20 pizza flavours like In Piazza, Stagioni, and Galiardo, that will leave you satisfied. For all our vegetarian friends, there are a couple of vegetarian-friendly options too so you can join in the fun, such as Bufalina and Ortolano. Settle at this casual Southern Italian spot serving freshly made pizzas and pasta as well. Their signature pizzas such as the Mondo Mio Pizza and Four Cheese Pizza are worth the try! Have a relaxing evening chowing down on pizzas fresh from the oven and watch the chefs as they work their magic in the open kitchen. 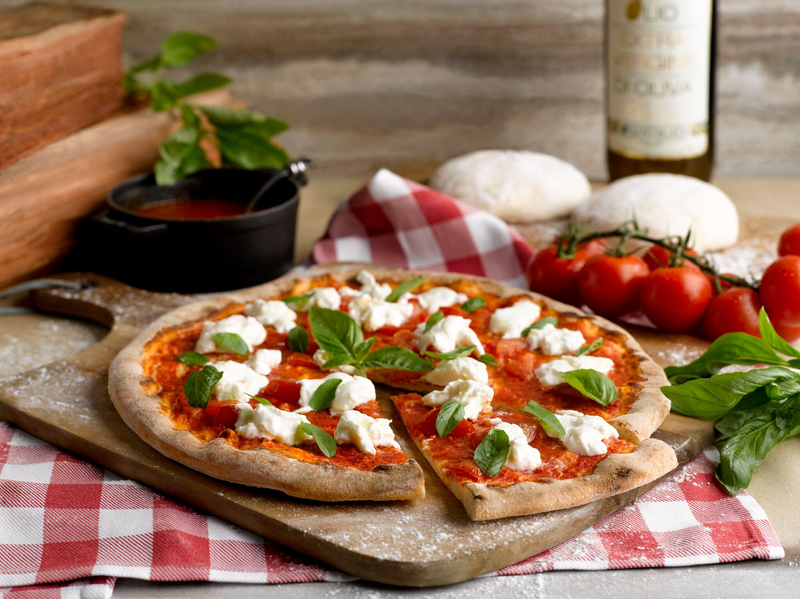 Located in Marina Bay Sands, this homestyle Italian bistro rolls out hearty pizzas that will excite your taste buds. One of the more interesting selections is the Torta Flambee, topped with smoky bacon and sour cream – think carbonara on a pizza! Other creations include Aglio Olio Pizza and Lamb Tongue Pizza. There are over 700 Italian wine labels to choose from, so pair them with your pizzas to complete the meal. Want good food, good drinks, good music, and good vibes? You’ll find it all at Timbre! Frequent diners at this popular hangout will always recommend the Roasted Duck Pizza, and we can see why: topped with a generous amount of crispy popiah skin, it adds a satisfying crunch to every bite. There are other flavours such as the Veronese Pizza, Spicy Szechuan Pizza, and more. Can’t make up your mind? Get the half & half and try all the flavours you want! This smart casual Italian eatery and bar along Hong Kong Street combines traditional Italian dishes with modern innovation. Besides the Roasted Chicken and Grilled Octopus, their pizzas taste equally delicious too with the finest ingredients and a crunchy crust that’s easily digestible and nutritious. The Broccoli Rabe and Pumpkin Pizza has an interesting flavour that you mustn’t miss! You need to come to this beautifully decorated restaurant that finds refuge along Robertson Quay if you’re looking for a relaxing spot to satisfy your Italian cravings. This place serves up handcrafted pizzas like the vegetarian Asparagus Pizza and Tartufata Pizza that are pleasing to the taste buds. The warm setting is perfect for any occasion, be it a romantic date or a large party.